Our Most Handsome Personalized T-Shirts are a great gift idea for Dad, Grandpa, uncles or anyone handsome man in your life! He'll love wearing a Personalized Shirt like this around the house or taking the kids to the park - makes a great personalized Father's Day shirt! This fun design is featured on our premium white, and ash 100% cotton T-Shirt and our 100% cotton natural colored t-shirt, machine washable in adult sizes S-3XL. Free personalization of any title, such as Dad, Grandpa or any title you choose & up to 30 names of your children or grandchildren is included. Grandpa has a shirt with grandkis and great grandkids on it. A lot of people will comment about it. He loves this. 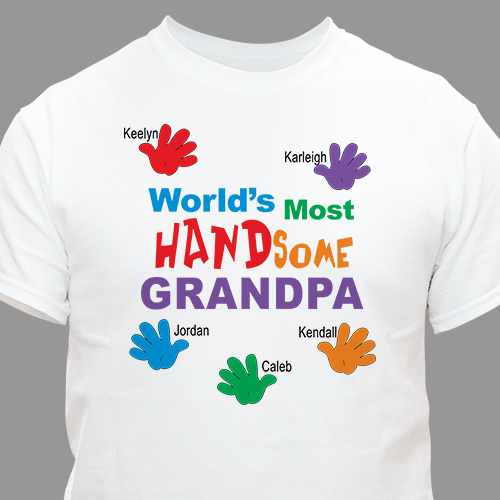 Additional Details Our Personalized T-shirt makes a great personalized gift for Uncle’s. Make the title Uncle Paul’s or any name and include the nieces and nephews. Makes a great gift for Dad on Father's Day, Birthdays or Grandpa on Grandparent's Day.